Some 30 years ago, my wife and I were invited to Edd Presnell’s annual pig pickin’. It was an event in Watauga County, N.C., and attracted up to 200 invitees. My wife was a schoolteacher and had Edd’s granddaughter, Mona McGrew, in her class, and therefore wangled an invite. Edd Presnell died in 1994, his wife, Nettie, three years later. The pig pickin’ ceased to be a yearly occurrence. Sic transit. The Presnell family had been in the area — mostly on the same mountain — since at least the time of Edd’s great-grandfather, James Presnell, who was born in 1796. The mountain was still full of Presnells, many of whom were named after presidents: James Monroe Presnell, Hoover Presnell, even Martin Van Buren Presnell. Of the lot, Edward Lee Pressnell, known as Edd, was the most famous. 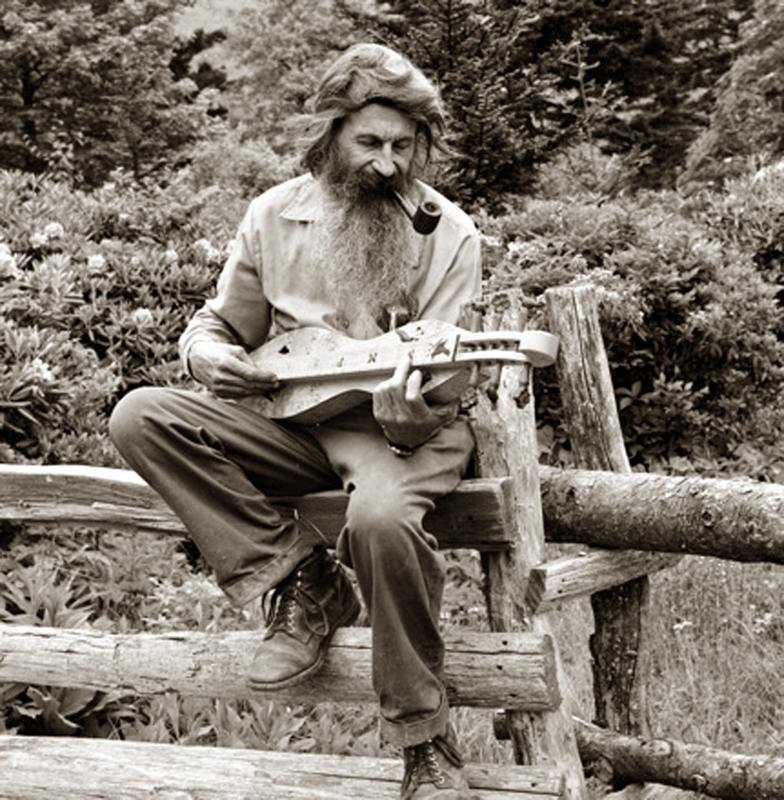 He was a renowned makers of dulcimers, and a spectacular woodcarver. How much of his look was calculated, and how much was culturally inherited is hard to tell. He sported a hillbilly beard, was thin as a rail and wore overalls; his hair seemed as if it hadn’t been combed since the Truman administration, and maybe hadn’t been barbered, either. But inside his home was a lattice-work room divider he had carved, 8-foot tall, of mountain laurel and birds that was as delicate and refined as anything made by the best trained beaux-arts master. It was not easy finding Edd Presnell’s place. It sat on the north face of Beech Mountain in Banner Elk, near Boone, N.C. and at the end of five miles of gravel road followed by another mile of tractor path. You can see why he wanted to stay in a location so remote: From his back porch you could see not only the local mountains of Watauga County, but also parts of Tennessee and Virginia. Mt. Rogers, the highest point in Virginia, loomed on his horizon. On the downhill side of his property there are deep woods and laurel thickets. His neighbors’ pasturelands cleared the view, so the trees never completely blocked it. And in the middle of the several houses, barns and cabins at the end of the tractor path, Edd Presnell constructed two beautiful trout ponds. So Edd retreated to one of the farther cabins to play pinochle with his brother while everyone else whooped and hollered. A pig picking, by the way, is when you roast a pig slowly, all day over a hickory coal fire, so the meat, sweet and juicy, pulls away from the bone. It is like a great Fourth of July picnic, with every variety of Southern comestible. The ice tea flowed in rivers. Two men were cleaning four or five trout in a bucket of water as we approached the ponds. Each wore a ballcap. He held up a beauty about 15 inches long and glistening in the sun. He slid his barlow knife along the trout’s belly and gutted it, holding it underwater to clean the slop away, then with a movement that told of years of experience, knifed the head clean off. “We save these for the cats,” he said, tossing the fishhead onto a pile of several. 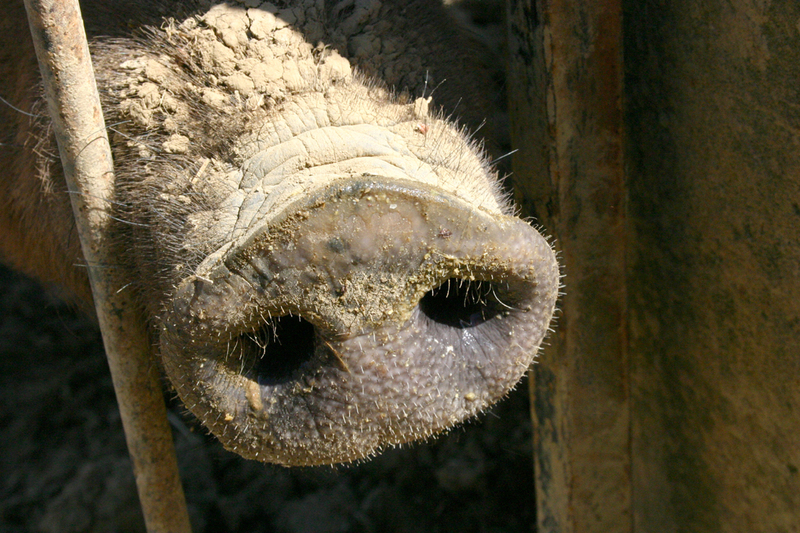 Nearby was a cinderblock pit with a hog splayed out with its opened belly cavity spread flat on the rack over the hickory coals glowing with white-hot heat. One elder, in another ballcap, was tending to the pig, brushing it every while in a once with a sauce that seemed to help crisp the fat. Next to the hog were the fillets of those trout we had watched being cleaned. I am no Izaak Walton, but my wife convinced me I should give the trout pond a try. So, we borrowed a rod and a wad of biscuit dough and headed to the pond. Across the water there was an artist of a fly fisher, with an angler’s cap, a canvas vest and a very impressive looking rod and reel, casting his line out over the water with the grace of a Fred Astaire. He cast his scintillating fly out once more and cranked it slowly back in. He swung his arm again and plopped the fly down in the middle of the pond like an expert. “Have you caught anything yet,” we asked. Now, there are different reasons for fishing. The pro angler was a genuine artist, and I am sure that he received great satisfaction out of the perfection of form he attained in his sport. But I have a different reason for fishing. Me, I like to eat trout. I’d use dynamite if it got me more fish to eat. So, I wadded up doughballs on my hook and dropped it down in the water. I cast my line out and the bait plinked reassuringly in the pond. Unfortunately, the hook was still at the tip of my rod. I tried once more and the line flew out a good two or three feet from the shore. A third time and my hook made it into deeper water. As I said, I’m no Izaak Walton. In contrast, the pro in the vest, now on the other side of the pond to avoid the children who had gathered around us, was a ballet dancer, so graceful was the flick of his wrist, so classic was the arch of his line. And I gave one last pull and landed the trout on the grass. One of the kids freed the hook and threaded an anchor line through its mouth and gills. It was a handsome prize, glimmering like silver in the sunlight. We anchored one end of the fishline in the soil of the bank and let the fish down into the cold water and I cast my line out again. Meanwhile the horde of children had found other playthings. There were crawdads in the mud and they were digging for them and taunting the crustaceans into nipping the air with their claws. There were also bright blue dragonflies careening across the surface of the water. Godfinches flitted from shrub to shrub. My line pulled a second time. I played with the second one just as I had the first and pulled him in. The pro on the other side was getting just a wee bit disgusted with me, I could tell. He still hadn’t landed anything. The kids dropped their crawfish and rushed over to see the new fish. We added the second trout to the first on the anchor line and wadded another piece of dough on the hook. I cast it out and hit my spot in the water. The sun was climbing ever higher and hotter. Water striders walked over the quiet pond surface. I hooked another one. This one was big. He must have been the same one that the pro had hooked earlier. He fought and splashed and flipped his gleaming body back and forth, but I cranked him in and landed him. He was about 17 inches long, impressive and handsome. The pro turned away. We added the big one to the string. I caught two more fish before the call went out for dinner. About 50 people were lined up for the beans, salads and vegetables. After piling our plates, we walked over to the pit and loaded up on pork and trout. Then we sat in the shade with about a dozen youngsters and lazily ate till our bellies burst. A breeze stirred our maple tree and made a low hiss. I licked my fingers and rose for another round of victuals. Heaven couldn’t be more satisfying. I could imagine his flybox full of hand-tied flies, each a masterpiece. And dull practicality won out over art once again, as it so often does in America. Later, when we cleaned the fish, it turned into an impromptu anatomy lesson for the children who followed us around all day. “Is that a girl fish or a boy fish,” one of them asked. “Eggs! That’s her eggs,” one girl shouted. They wanted to touch. “Can I have the head?” asked one of the boys. In the distance, behind the house, we could hear Edd’s wife, Nettie, singing “Wildwood Flowers” and “Amazing Grace” to a small audience. The clouds drifting across the skies, the herky-jerky of thousands of butterflies, the glistening blue of the dragonflies, the chirrup of the redwings, the splash of the trout, the laughter of children, the drawling conversation of the elders — they were all of a piece. As the afternoon lengthened, carloads of guests began leaving and we gathered up our trout, wrapped in aluminum foil to take home to our freezer and started our dusty, gravel-filled way back off the mountain. And as we drove off, we could see Edd, sitting on the front porch with Baxter, rocking back and forth, probably discussing rabbit hunting or the heat. DEFINITELY NOT THE HOUSE THEY LIVED IN. THERE WAS ONLY ONE HOUSE AND A WOOD SHOP, WHERE THEY DID THEIR WORK. MY GRANDPA NEVER WORE OVERALLS OR PLAYED PINOCHLE. HE WAS ALWAYS PRESENT AT THE PIG ROAST AS A GOOD HOST WOULD BE. GRANDPA WAS A VERY FRIENDLY AND OUTGOING MAN. MY GRANDMA WAS A MASTER AT PLAYING THE DULCIMER, BUT SHE NEVER SANG THE SONGS, SHE PLAYED THEM. I am the second oldest grandchild of Edd and Nettie Presnell. And I feel the same as my sister Deanne. We knew our Grandparents better than anyone. We attended the yearly Pig Roast that our Grandparents hosted. I am not sure how you came about with your version of our family get together. But it is insulting to our family what you wrote. If you enjoyed yourself so much and were happy to be invited then why did you portray the whole event the way you did? You should have not used any pictures at all if you did not have the right pictures from the actual event. The house you showed was from the Meatcamp area not Beech Mtn. How is that depicting anything but a lie? My Grandpa was a proud man and worked hard for everything he had. He was a master craftsman and won many awards during his lifetime. He believed in only telling the truth. He nor my Grandma are here today to defend themselves or dispute your version of their event. But if he were here today you Sir would be getting a piece of his mind. He would tell you real fast to tell the truth or tell nothing at all. Thank you Melanie McGrew. My grandfather was an intelligent, talented, social man. The Saturday before Memorial Day was “his day”. He was ALWAYS in attendance, mingling with his guests, even after getting up in the wee hours of the morning to put the pig on to roast. I’m not sure who told you that Papaw played pinochle, but to my knowledge (and my mother’s – his daughter) he never played. As for him “retreat(ing) to one of the farther cabins” on the property, I’m not sure where you were, but there are (and were) no cabins on his property. He and my grandma lived in a brick house with a workshop across the driveway where they created their beautiful works of art. There was (is) another house across the ponds where my uncle and his family lived. There weren’t “several houses, barns and cabins” on the property. Papaw wore “dungarees” not overalls. I never saw Papaw in a pair of overalls in my life. If you were going for the stereotype that all mountain “hillbillies” wear overalls, you got it wrong. As for the statement “his hair seemed as if it hadn’t been combed since the Truman administration, and maybe hadn’t been barbered, either” I know you are going for literary enhancement, but in fact what you are insinuating is that he didn’t have good hygiene or maybe that all mountain people have bad hygiene. Either way, it is untrue. As for the way you quote mountain folk as talking, “’ thems others is browns’” (by the way, he only stocked rainbow trout in his ponds) and “’If’n it works” I find it especially insulting and disrespectful. Like every other part of the world, the mountains have a certain dialect. However, we are not uneducated and I find it very hard to believe that anyone at the pig picking talked like that, especially when the second quote is supposedly from the “master fly fisher” from Goldsboro, NC. I suppose the only people to associate with mountain folk are uneducated people from other parts of North Carolina. Another stereotype that is incorrect. My grandma played the sweetest music possible on the dulcimer. She taught all of her grandchildren to play as well. But when she played, she did not sing. In fact, it was very rare that anyone would sing along because the music she created was so beautiful. She is featured on professional recordings and has appeared in advertisements for Appalachian music. She was a true artist and woodcarver in her own right. 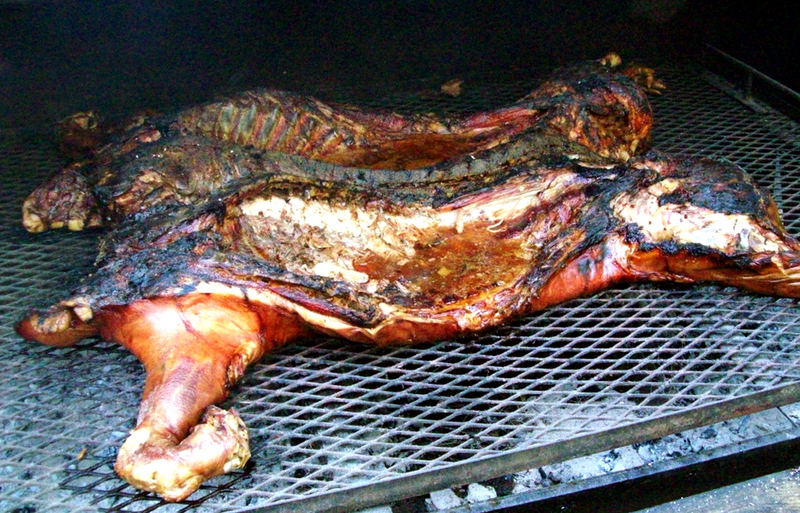 So, Mr. Nilsen, if you intended to give people a picture of what a mountain pig roast is like, you failed. When people who truly knew my grandparents read this, they will see the untruths, exaggerations and stereotypes. My concern is for those who did not know them personally. You have done them a disservice; because to know my grandparents was to know two beautiful, kind, generous, intelligent, resourceful, honest, talented, hardworking individuals who loved their family and friends; not two uneducated hillbillies. I’m proud to have wonderful memories of my grandparents and their pig roasts. Maybe I need to write a blog on what writers from New Jersey are like, but my grandparents taught me that if I can’t say something nice, not to say anything at all. That’s the mountain way.